What's the meaning of ending bytes in each PS1 mode2 sector? I trying to make PSX CD image repacker for own needs. I need to make it to be free from third-party repackers. This is the structure schema that I understand from the image. Other repackers changes that ending bytes when something is repacked, so I need to do the same, but I don't even know what is that and what rules applies to it. Most of time it looks like something compressed, but rarely is a lot of zeros and few non zero bytes. 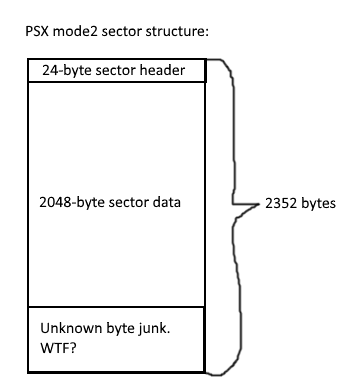 Re: What's the meaning of ending bytes in each PS1 mode2 sector? Did you try looking up the answer first? It's described on Wikipedia. The header you're referring to is actually a combination of several different things, and the mess of code at the end is for error detection and correction. Question though: Why do you need to be free from other ISO rebuilding programs? Do they not do something you need? Programming another one seems like a lot of effort for something that's already been done, unless you just want the experience. if you put everything else in its place correctly and leave these spots empty, then this program http://www.romhacking.net/utilities/1264/ will fill them for you. 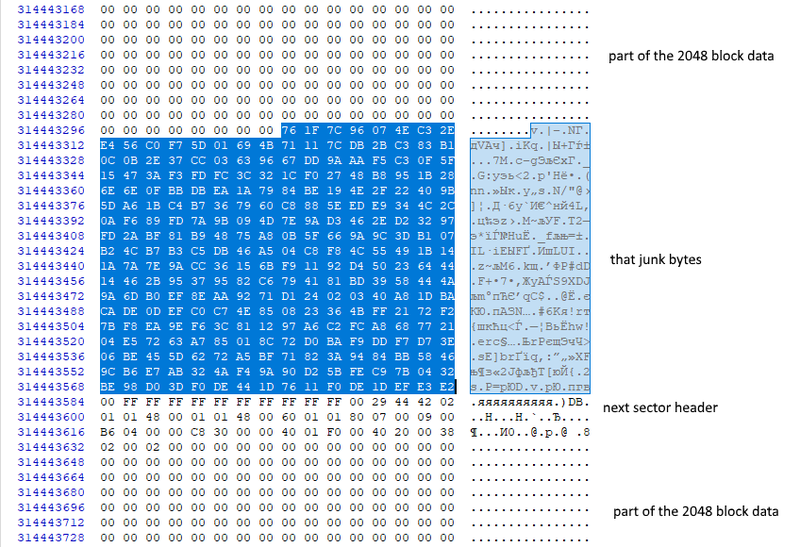 there's source code in there if you really want to see how. Thanks everyone for the answers. I already solved my issue by leaving these things untouched at rebuilding. CD-burning device corrects them anyway, while emulators ignores it. So I just forget about it.